This is a sweet and spicy curry. I learnt this from my Sudha pachi in mulleria. She prepares this excellently. Its my husband’s favourite dish and she never forgets to prepare this whenever we go there. Since this is an No onion No Garlic dish this is prepared in our temples also. Pressure cook ash gourde with salt and jaggery for 2-3 whistles. (Remember not to overcook). Heat 1 ½ tbsp oil in kadai, add mustard seeds, methi seeds, urad dal, sesame seeds fry for a minute then add grated coconut. When coconut becomes light brown add red chilly and fry till dark brown. Then grind it to coarse paste. Add this masala into the boiled vegetable and boil for 5 to 10 minutes. Heat ½ tbsp oil in a frying pan add mustard seeds, pinch of hing and curry leaves. Pour this on the boiling curry. 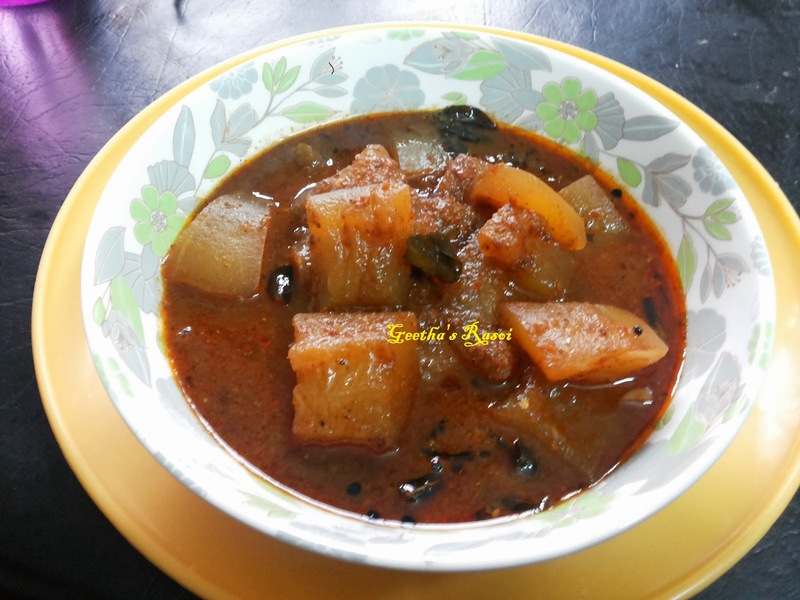 Puli koddel is ready to serve with steamed white rice.